Who knows what you have to do to save an ambiguous amount of money. Or, perhaps, spending your money on tobacco is not saving it. Thanks, Katy Lin. Not to mention, the unnecessary underscore. If not supplies, then what? Good news though, it is a "limited time offer" so I guess there's plenty of time to figure it out. 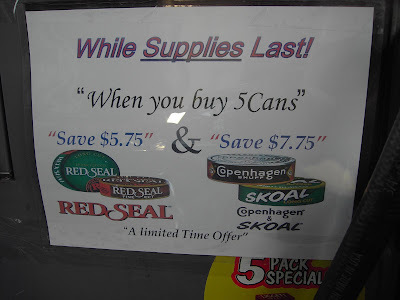 I believe "limited time offer" means until you get mouth cancer. Yuck!